When a Republican party wins the General Election, they strip the royal family of everything and send them to live on a housing estate in the Midlands. Exchanging caviar for boiled eggs, servants for a social worker named Trish, the Queen and her family learn what it means to be poor among the great unwashed. Is their breeding sufficient to allow them to rise above their changed circumstance or deep down are they really just like everyone else? 1. 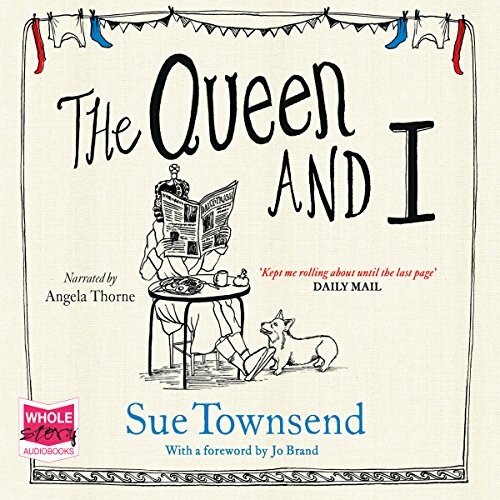 It will be biased because I ADORE Sue Townsend and everything she writes. I will read and re-read the Adrian Mole series until the day I die. It's just how it is. 2. I commute in HEAVY traffic and am bitchy and cynical during most of this time. Light-hearted does not tend to get me through bumper-to-bumper traffic (my library speaks to this). This book made me smile....in traffic. Ok, I don't care about character development, plot feasibility, or anything thing else because this book made me FEEL GOOD. However, the characters ARE well-developed and the plot, while admittedly unrealistic, was an interesting concept and was done with respect to both the monarchy and the working class. This is a sweet, heart-warming story that doesn't over-indulge on the sugar. There is enough dry wit thrown in so the tone strikes a perfect balance. Damn it, if those Brits don't always do humor up right! Listen to it, laugh, maybe cry and let yourself....FEEL GOOD! If you could sum up The Queen and I in three words, what would they be? Have you listened to any of Angela Thorne?? ?s other performances before? How does this one compare? I cannot find any other books read by Angela thorne on Audible!! I do read quite a lot of British fiction. This book was an anomoly .... I found the story and dialogue to be boring and a bit sad. The end, however, was very meaningful and a lesson in government that many americans might find instructive at the present time. Would I recommend the listen? No. Did it nonetheless have an important message? Yes. If you love the Queen of England as much as I do, you're in for a treat. There are a few of these sorts of stories out there, fanciful stories of QE2 out in the world, living some other sort of life. This one is great. It has Elizabeth, Philip, Charles, Diana, William and Harry as well as Margaret and at least one of the corgis. It's set in the early 90's, and it's not a tear-jerker. If I shed any tears on this book, it was because I was laughing. It's funny, and at least from an American perspective, I think it's respectful. No cheap shots, just a fish-out-of water kind of story. The audio sample gives a very good idea of what you're in for. The narrator deserves an award or something. She nailed it. The narration brings so much to the story that it takes it to a higher level. I gave the story 4 stars, but I would have given it 3.5 if that were an option, only because the writing actually does get a little weak toward the end. It's a case of.... you create this fantastical situation... now how to you wrap it up? how do you actually end this kind of story. No spoilers, but unfortunately, the writer disappoints a little with her answer to that question. It's literally the only criticism I have of the writing, but it is a necessarily important point. Having said that, I will look for more work by both the author and the narrator. This was a very fun, lighthearted listen. Would you listen to The Queen and I again? Why? would listen again, so much happening i must of missed some bits while laughing!! A fabulous idea for a book (I wonder if any of the royals have read it? I would love to know their opinion!) and I still found it relevant and engaging despite my reading it a decade or so after the fact. Great political satire, great characters, despite many being hugely exaggerated stereotypes, this added to the humour and was just right for this book! Love Sue Townsend, no cringe-worthy cliches in her writing, and this is one of her best. Not wanting to give away any spoilers, I felt really let down by the end. It was almost as if the author had reached her required word count and then tried to finish as quickly as possible. Overall, I felt that the plot had dated quite badly. What did you like best about The Queen and I? What did you like least? I expected a really funny story but it was rather mundane and although I had one or two smiles,overall it was not that funny. Would you recommend The Queen and I to your friends? Why or why not? What does Angela Thorne bring to the story that you wouldn’t experience if you had only read the book? Did The Queen and I inspire you to do anything? Laugh out loud and giggle in between! It made me laugh out loud between giggling and smiling. Seriously funny even for a Royalist! This had been on my list of books I should read for such a long time. I was concerned that it would be in some way disrespectful, even though I am not 'a royalist'. Saying that, it has been really funny in parts, some real laugh out loud moments at the absurdity of it all. I have found myself in the position of the residents of hell close, on benefits with little spare change and could really identify with all of the things people do to manage from day to day, the thought of the Queen and the Royal family doing the same was so funny. I will definitely be buying the sequel. The Queen is deposed and sent to live on a council estate. It is an interesting premise with limited scope for development, so where might that lead us. The answer is absolutely nowhere at all. I only continued listening because the work is short and I was intrigued as to how this aimless nonsense would be brought to any sort of conclusion. It is no spoiler alert to bemoan that I had though "It was all a terrible dream" was an ending restricted to books for the under-8s. I found myself feeling embarrassed for the author. Angela Thorne initially makes a brave attempt to polish the unpolishable, but even she succumbs to lazy stereotyping in accent choice. The only saving grace is that it is short.